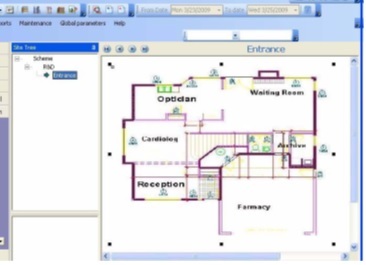 This module provides a dynamic graphic representation of the layout of the organization. 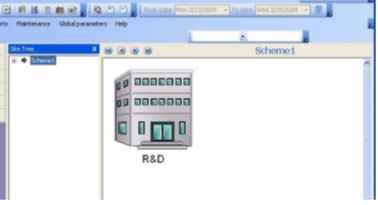 The database used for this module is shared with the Door module (see Access Control). Therefore, any changes made to the database are simultaneously reflected in both modules. Click a building in the toolbar and enter a name for the Building. The building now appears in the Work screen. Step 2.Click the Building to drill down to the next stage. Here you can call a “floor” scheme. Step 3.Select the Floor icon and enter a name for the floor. You can add as many floors as needed for the building. Step 4.In the floor level you can import a map of the floor design by right clicking and choosing Import Map Scheme. Step 5.When the map in the screen you can unlock the map and enlarge the picture on the screen. Step 6.Now you can add doorways, controllers and devices where they reside. Step 7.Define the functionality and settings for each of the controllers and devices as you set them. To move the controllers and devices around the screen unlock the map with the unlock button. 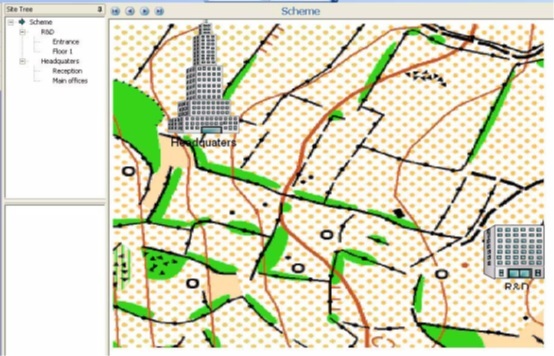 Step 8.You can add buildings as needed, and import a map of the city to locate the buildings on the map. When your organization design is in place and the devices set-up, your screen may resemble the example below.